Several years ago, there was an advertising campaign put on by the local Mormon newspaper, The Deseret News. The campaign said simply "Written in the interest of time... Your time." Simply put, it would make for a quick read. And easy to understand. 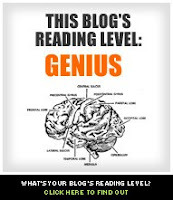 A fun feature in the blogosphere is the Blog Readability Test [sadly now offline]. Put in a blog's web address, and it'll tell you what the readability level is. Mine ranges from High School to College Undergrad, one post even registered Genius. Jenn's is at College undergrad on a regular basis. 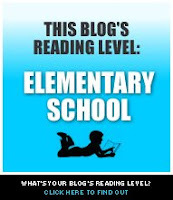 It's not the content that's High School level, it's the readability level. K? But as the Readability site suggests, "This tool also works on myspace profiles, livejournals, facebook, and most websites". Including The Deseret News. Daily, The Deseret News has the following readability level: I suppose one could gather that it is easy to read the News because the readability level is so low, but one has to wonder - since the majority of people who read the News are Mormon, that maybe it's written this way because the reading level of Mormons is Elementary Level?